Part 2 of my challenge to build The Stig from Top Gear a new ride, in this video i finish of the mechanical base so all we need is a paint job the its time to have a blast..........and maybe set a record? 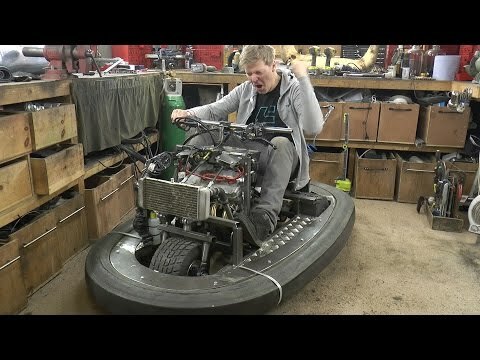 Part 3 https://youtu.be/fGr0oifJMEI Part 1 here https://youtu.be/tEQopnaHipo Order The Colin Furze book aimed at kids 6+ which is full of little projects to turn them into little inventors and loads of pictures of my previous projects http://smarturl.it/C-Furze This is a sponsored project by BBC Worldwide Check out Series 24 of Top Gear here https://www.youtube.com/watch?v=NyAKoKi-8k0 See the other Epic Vehicles i've made and why i got given the job here https://www.youtube.com/playlist?list=PLGjbAdaOBLBnaHyo8G3xt7cVTg5asaR3L Social stuff here people Twitter https://twitter.com/colin_furze Instagram https://www.instagram.com/realcolinfurze/ Facebook https://www.facebook.com/Colin-furze-521680751253584 MUSIC 1st Track is called "stay true to yourself" and is by "Noisey Way" More on them here Bandcamp : https://noisyway.bandcamp.com Facebook : https://www.facebook.com/noisyway Youtube : https://www.youtube.com/watch?v=JkLAhmzs4kQ 2nd Track is called "Goodbye Kiss" and is by "Not tonight and the Headaches" more on them here https://nottonightandtheheadaches.bandcamp.com/album/if-you-were-real-youd-do-your-own-stunts 3rd Track is called "The Silence" and is by "Heroic" more from them here https://www.youtube.com/channel/UCdXCWj8fXdLAMfsCEXqxrKQ In a band, want your music on my videos! Send your tracks to furzemail@yahoo.co.uk as all music on this channel is from viewer's.